Make phone calls, share information, and join a “Day of Action” this Tuesday. For the second week in a row, we’ve faced a blizzard of hearings for President Trump’s cabinet nominees. Betsy DeVos, who has pushed for the privatization of public schools and argued that school choice could help to “advance God’s kingdom,” had her hearing on Tuesday. Wednesday, we heard from Scott Pruitt, a man who spent his career suing the Environmental Protection Agency and who now wants to head it, and Tom Price, the anti-choice nominee for health-and-human-services secretary who is hell-bent on repealing Obamacare. Finally, yesterday we had hearings for Goldman Sachs alum Steven Mnuchin for Treasury secretary and Rick Perry for head of the Department of Energy, an agency he once said should be eliminated. And of course, today Donald Trump became president. Despite his claim that he would stand up for the working class, Trump has chosen numerous Goldman Sachs alumni to join his administration. 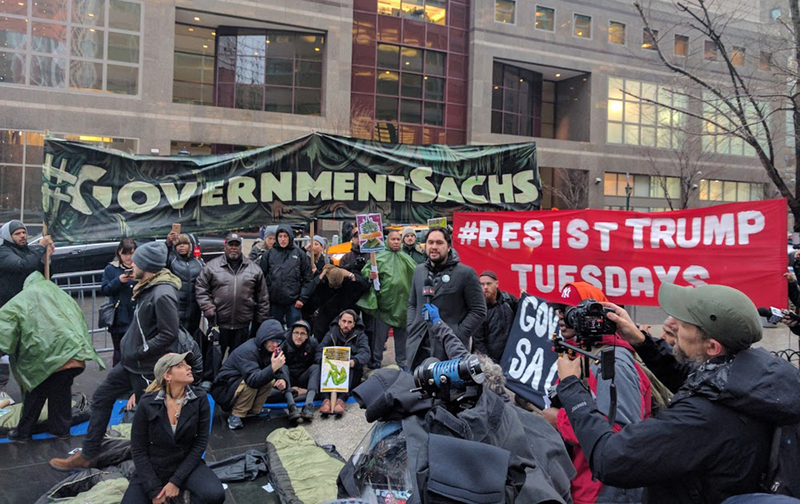 The list includes Stephen Bannon and Steven Mnuchin, whose career after Goldman included running a bank referred to as a “foreclosure machine.” Since Tuesday, January 17th, activists organized by New York Communities for Change and Resist Here have been camping outside Goldman Sachs headquarters in NYC as part of #ResistTrumpTuesdays. The participants are fighting against all cabinet nominees from Goldman Sachs, Wall Street, and the billionaire elite and they’ll be camping out through the inauguration today. You can follow their actions at #GovernmentSachs on Twitter and Facebook. Next week Tuesday, January 24th, members of the Working Families Party, MoveOn.org, People’s Action, and their allies will hold “Stop Trump’s #SwampCabinet” rallies and media events at senate offices across the country. They’ll urge senators to do everything in their power to block, delay, and oppose Trump’s terrifying nominees. You can sign up to host an event here or search for an action near you here. The coalition behind BlockTrumpsCabinet.com (which includes The Nation) have launched a call tool to help you block Steve “foreclosure king” Mnuchin from becoming Treasury secretary. Click here to use the tool. Student Debt Crisis is running an ongoing campaign to call senators and demand that they reject DeVos as education secretary. See a suggested script here and join its Facebook group here. BlockTrumpsCabinet.com has also launched a tool to stop Jeff Sessions (we wrote about it last week). Click here to use call your senators about Sessions. Zoë Carpenter on Betsy Devos’s horrible confirmation hearing. David Dayen on the weaknesses of some of Trump’s nominees, including Tom Price and Andy Puzder.